Honey bee pollination is directly or indirectly responsible for almost 1/3 of our food products. Each year a migratory colony may travel up to 11,000 miles by truck to pollinate important food staples and produce the honey we love. 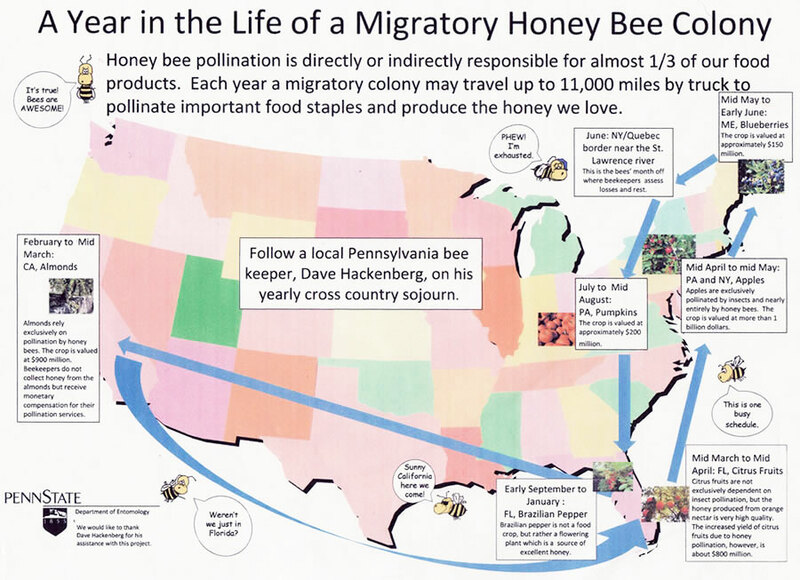 Learn more about the pollination of honey bees in the United States. In California for Almonds: Almonds rely exclusively on pollination by honey bees. The crop is valued at $900 million. Beekeepers do not collect honey from the almonds but receive monetary compensation for their pollination services. In Florida for Citrus Fruits: Citrus fruits are not exclusively dependent on insect pollination, but the honey produced from orange nectar is very high quality. The increased yield of citrus fruits due to honey pollination, however is about $800 million. In Pennsylvania and New York for Apples: Apples are exclusively pollinated by insects and nearly entirely by honey bees. The crop is valued at more than 1 billion dollars. In Maine for Blueberries: The crop is valued at approximately $150 million. In New York, near the St. Lawrence River: This is the honey production month for the bees. In Pennsylvania for Pumpkins: Pumpkins are valued at approximately $200 million. In Florida for Brazilian Peppers: Brazilian pepper is not a food crop, but rather a flowering plant which is a source of excellent honey.